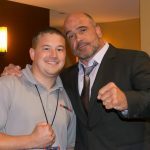 Carvalho had the belt wrapped around his waist by Bellator MMA President Scott Coker after sending Halsey to the mat in a heap, with a perfectly placed liver kick in front of a packed house at the Mohegan Sun Arena. The 29-year-old Brazilian fighter was an exorbitant underdog heading into the matchup, but as the saying goes, that’s why they fight. The next time Carvalho enters an arena, his banner will now hang from the rafters. Much like the last time Brennan Ward (12-3) competed in his homestate of Connecticut, “Irish” caught Dennis Olson (14-10) with a right hand that sent “The Menace” to the mat, where Ward quickly pounced and forced the hand of referee John McCarthy. The finish came at 4:37 of the opening round. Olson proved to be tough enough to withstand multiple flurries from Ward, even landing an upkick that seemed to hurt Ward when he tried to score a finish early. But Ward refused to let up, making sure he sent his friends and family home with a smile on their faces. “I’m a hometown guy. Dennis and I talked a lot of stuff before the fight, but it was a battle in there. I have nothing but respect for him. He’s tough as hell. He almost knocked me out off his back with an elbow. There are plenty of matchups that make sense for a striker the caliber of Ward, Bellator MMA fans will need to keep close tabs as 2016 quickly approaches. The Bellator MMA debut of Isao Kobayashi (17-3) didn’t go as planned at “Bellator 144: Halsey vs. Carvalho,” as Goiti Yamauchi (19-2) finished the Japanese fighter with a rear-naked choke submission at 3:50 of the final frame. With the win, Yamauchi tied former Bellator MMA Featherweight Champion Pat Curran, Daniel Straus, Alexandre Bezerra and Marlon Sandro for most submissions (15) in 145-pound history. 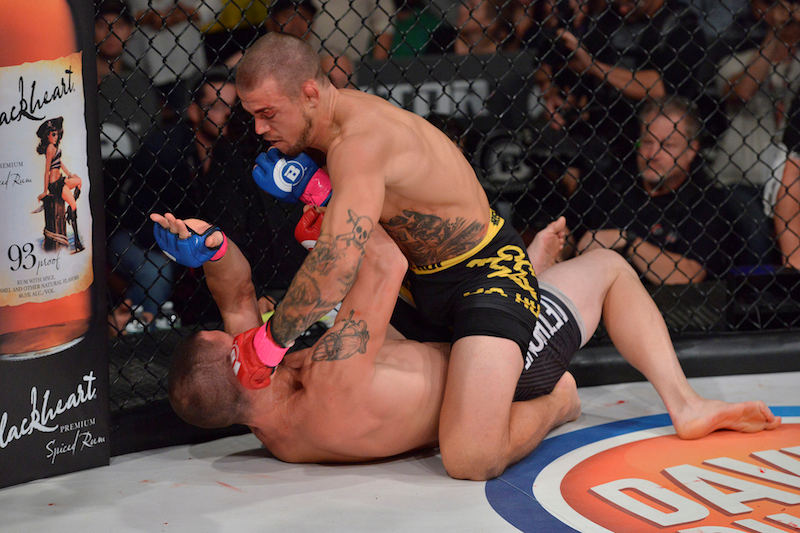 After the contest, the 22-year-old had some pointed words for current featherweight champion Patricio Freire. 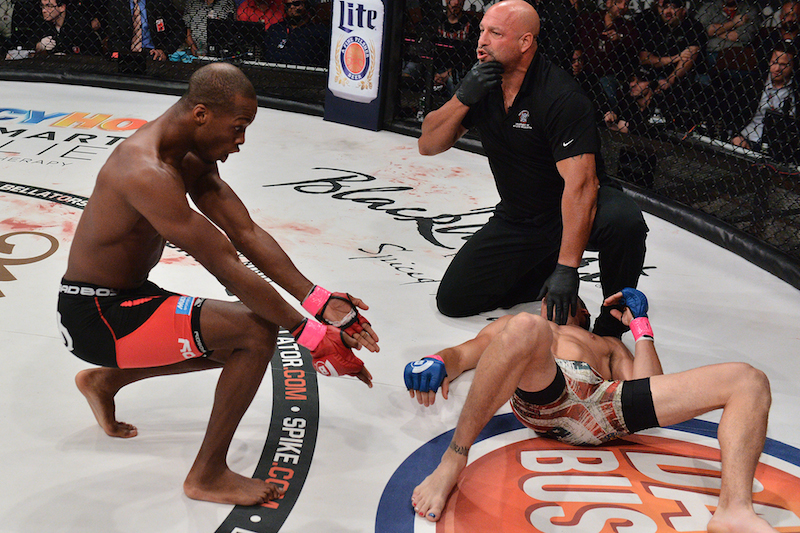 In the opening main card bout at “Bellator 144: Halsey vs. Carvalho,” Michael Page (9-0) remained undefeated after finishing Charlie Ontiveros (6-4) with vicious elbows at 3:20 in the first round. 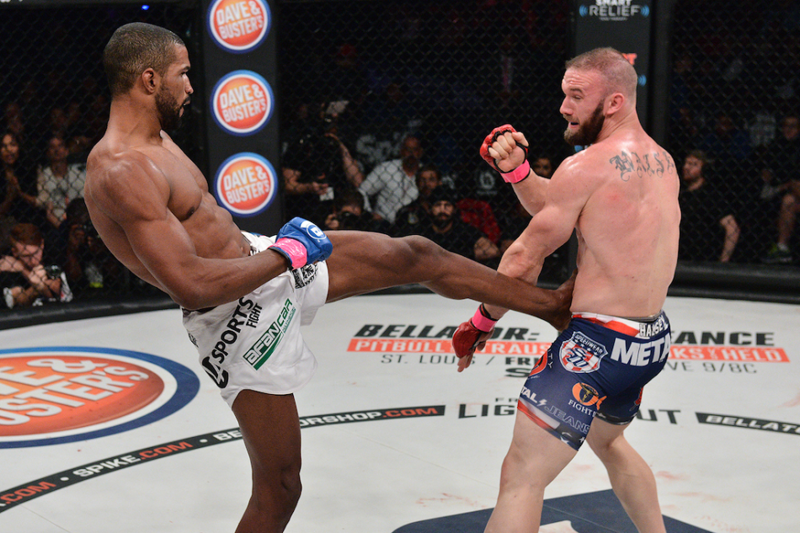 Previously, “Venom” has usually showcased his striking while standing upright, but on Friday, Page quickly took dominant position on the mat against his opponent and dropped perfectly placed elbows to the jaw of Ontiveros, forcing the Bellator MMA newcomer to verbally submit. With the win, Page has now finished eight of his nine wins as a professional in the opening round, a trend that the 28-year-old hopes to parlay into a title shot sooner rather than later.